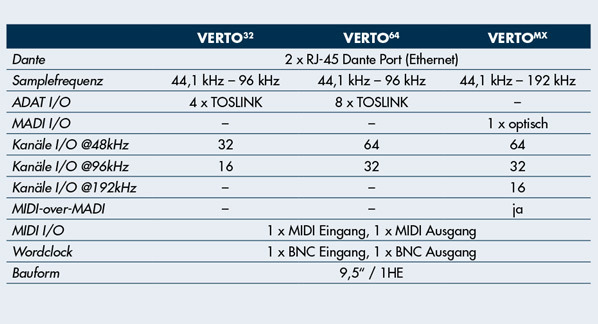 The VERTO series make integration of digital ADAT and MADI into an existing DANTE network really easy. The compact enclosure of 1RU height and a ½-19“ width saves a lot of rack space. Every VERTO device features word clock I/O for external synchronization and is remote controllable via MIDI or MIDI-over-MADI (VERTOMX). No matter if used together with our A16 MKII, A32 or Pulse16, or a converter from another brand – simply connect to the VERTO via ADAT or MADI – and you’re ready to go! Both the VERTO series and all other converters from Ferrofish can be remotely controlled via the DANTE Network. If all devices are connected via MIDI, the VERTO converts all DANTE audio streams to ADAT or MADI and the control commands sent over DANTE into MIDI remote control messages. The VERTOMX offers an additional feature: Instead of a separate MIDI Port the MIDI messages are extracted from the MIDI-over-MADI port.